The USDOT is now accepting comments on a proposed rule change to require all states to measure traffic congestion in a consistent manner. The new rule calls for states to measure the speed and delay of car travel. Why the emphasis on car speeds alone? What about the person without a car or the delay people riding transit, walking or bicycling encounter in getting where they need to go? What we measure has important impacts on what infrastructure state DOTs will choose to build. Digging further into the details (wonk alert! ), USDOT proposes “delay per capita” as the congestion performance measure. “Delay” is the absence of speed of cars, buses and trucks. For example, MnDOT defines congestion delay as any travel below 45 mph—and a large driving public gets daily traffic reports. The USDOT’s proposed measure, “delay per capita,” fails as a multimodal measure for two key reasons. One, the cause of delay can’t reliably be pinned down. There could be many factors leading to less delay per capita, including increases in road capacity, a shift to off-peak travel, more people using transit, bicycling, or walking, or less economic activity per capita. The relative impact of each of these factors is critical to know as we assess the performance of future transportation investments. Second, it doesn’t tell us anything about the performance of the transit, bicycling, or walking systems. Mode share (the proportion of people driving, taking transit, bicycling or walking) has an impact on total delay. Under the proposed rule, a bus carrying 30 people would cause the same amount of measured delay as 2-3 cars (likely with only 1 person each): same road space but 30 versus 3 people moved. And it doesn’t tell us about the availability of transit or delays experienced by transit riders, bicyclists, or pedestrians. Big picture: the focus on car speeds and delay puts too much focus on cars not people, and too much focus on mobility rather than accessibility. Traffic engineers define mobility as how fast cars and trucks are moving; broader thinkers define accessibility as the ability to get where one desires regardless of the mode. For the last fifty years, traffic engineers have focused on mobility, resulting in an emphasis on expanding road capacity. But, far too often road expansions induce more car trips, meaning the benefit of reduced traffic delay is ephemeral. Speed measures don’t capture these diminished returns over time. The US DOT shouldn’t be in a rush to more thoroughly measure car speeds/delays until it is ready to advance complimentary measures for all transportation modes. The USDOT worked on bicycle and pedestrian measures, through its Volpe Center, as part of the Nonmotorized Transportation Pilot Program. Individual states also are setting up multimodal measurement tools. These measures will not advance if they aren’t included in proposed rulemaking. At a time when travel patterns are changing and more people are using transportation options, this is more important than ever. Measure trip times and access to options rather than car speeds. Incorporate measures that include other modes and societal outcomes, such as: service measures for transit, bicycling and walking; total vehicle miles traveled or car trips generated (an approach California recently embraced); the extent of carbon pollution and energy efficiency not just smog emissions; or access to opportunity by income and race. Open up the toolbox to allow for more local experimentation and innovation with tolls and road pricing. Congestion always occurs where there is no direct price on something consumers strongly demand. USDOT says in its proposed rule that federal officials “would like to move to a measure in the future that would consider the mobility of travelers using all surface modes of transportation and is seeking comment on feasible approaches that can be taken to move toward the development of such as measure.” Tell them to incorporate such measures now. 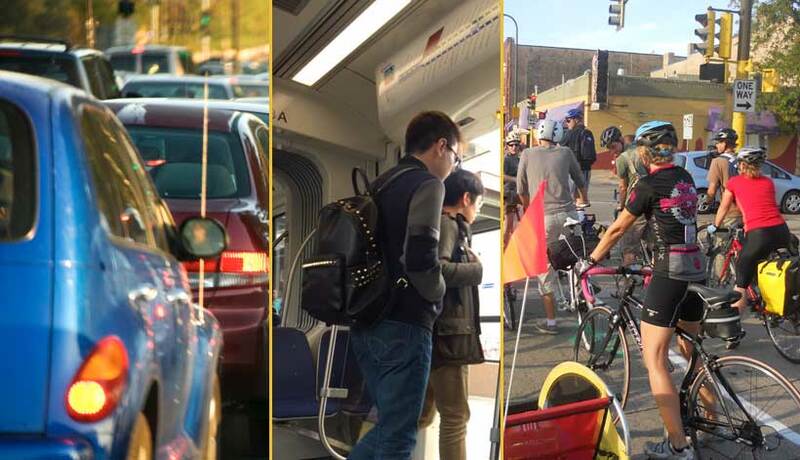 Send an email to the USDOT rule-making office, urging them to find a way to measure other surface transportation modes (e.g., transit, bicycling, walking, sharing) before, or in tandem with, getting even better at measuring car speeds – which taken solo leaves so much out of the performance question. Here’s the email: PerformanceMeasuresRulemaking@dot.gov. Also consider signing on to Transportation for America’s letter to Secretary Foxx and joining the #CountMeToo campaign. And, for wonks, click here for the proposed rule.